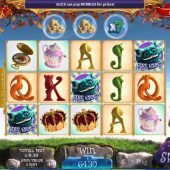 Adventures Beyond Wonderland slot goes, well, beyond anything I've ever seen! Following on from the original Adventures In Wonderland this game encapsulates the famous children's novel involving Alice. Ash Gaming have built this game to be as fantastic and zany as the original story was. From the movie introduction as the game loads to when you spin the reels the graphics and sound effects are excellent with the soundbites and music you'd expect of these characters. So will Adventures Beyond Wonderland slot have you grinning like that Cheshire Cat? Nothing is as it seems in Wonderland despite a normal looking 243-way slot over 5 reels and 3 rows. Now as soon as I describe the top pays you'll notice something odd. The best pays are the Crowns at 12x bet for 7-of-a-kind then the pocket watches, drink-me potion, mad hat and teapot from 7 down to 4x bet respectively. The card values remain which either pay 2.5 or 3.5 for the 7. The Alice Wilds appear on all reels too and simply substitute, or on their own pay the highest Crown symbol pay. So why do I mention 7-of-a-kinds? There are 3 in-play random features and you will notice there are bubbles above the centre 3 reels. The caterpillar to the right of the reels may throw one of 3 items into them and they move left each spin and disappear off when reaching reel 2. This is similar to what Netent's Egg-o-matic slot does. Now Alice may randomly drop onto one of these reels to create a stacked Wild reel for that spin and if the Caterpillar has thrown a prize into that bubble Alice breaks it on the way down and you get the prize. The first two are simple enough, a pile of coins for a small win or a mystery multiplier for 2-10x on any wins created for that spin. The third possibility is the drink-me potion and this is where things start to go crazy in Wonderland - if Alice falls through a bubble containing that, her normal stacked Wild will spread to one or two adjacent reels creating a block Wild of either 2x3 or 3x3 tiles. When this happens to two reels the game will add a sixth reel making it 729-ways for that spin or if you get all 3 reels Wild, a seventh reel so it becomes 2187-ways for the spin! Now is time to mention the Cheshire Cat, if you're wondering where he's been - when he appears on reels 1, 3 and 5 you he gives you 5 free games and then gets sucked into the vortex to Wonderland and each time he appears as he swirls around it he gives you more spins until he vanishes for good. You usually get 10 or 15 and this where Wonderland becomes even madder! This time the reels spin as rows, not columns - yes, the 3 rows spin horizontally in this upside-down world! The Cheshire Cat hasn't finished yet as he spends the bonus sitting by the left of the game and each time he grins he adds a sticky Wild to the reels. If 2 or 3 land in the same row it becomes 6 or 7 tiles across respectively but these Wilds may disappear too after so many spins. So you end up playing 3 rows which at any time can be any permutation of 5, 6 or 7 tiles wide so your ways to win can be anything from 243 to 2187 on any given free game! The normal Alice Wilds are still on all the reels too but these don't make the rows bigger or stick. This round usually pays very well.